Welcome... to a new BFME2 experience! 1) ...sick of the way EA mistreated the Lord of the Rings licence and made this game pretty pathetic in many aspects? Mainly in terms of the useless and actually non existing BALANCE and the utter lack of "REALISM"? 2) ...dreaming of a BFME2 mod that puts that "MOVIE FEELING" into the game, mainly in terms of units, their abilities and their looks? Something that EA should have done from start actually, since this was a MOVIE license as well, right!? 3) ...in love with the awesome and fantastic movies Peter Jackson directed, based on the wonderful work of Professor Tolkien! 3) ...quite simply looking for a "cure" to this game? >>> Then THIS is the mod for you!!! This mod is a SKIRMISH mod only!!! (So far!) Campaign and WotR is NOT supported (yet)! This mod is MUCH SLOWER that EA's dreadfully annoying rush-original, and it is MEANT to be that way!!! This mod is focused on S T R A T E G Y rather than action... in EARLY game! The author (me) is a great lover of real classical strategy games like Settlers (IV) and such, and that's why I wanted SEE to play more like a classic strategy game with more time to build massive bases with strategical layout, and plan your attacks with no unrealistic rush. BUT, you will get PLENTY of action LATER in the game though, when all players have had time to gather resources, build their bases and raised their armies! About 20-30 mins into the game, things DO heat up more and more - trust me!!! This mod is NOT about adding hundreds of new fictional non LotR unit types! This mod does NOT use anything that could not, in some way, be related to the LotR movies - OR the books by Sir Tolkien! This mod is NOT about "mirroring" the lore of the books (even though they are unbeleivably fantastic)! It's (one again) all about primarily catching the spirit of the MOVIES! Secondly - the books! This mod is dedicated to Mr Peter Jackson - the Director of the Lord of the Rings movies... and to the memory of Professor Tolkien. 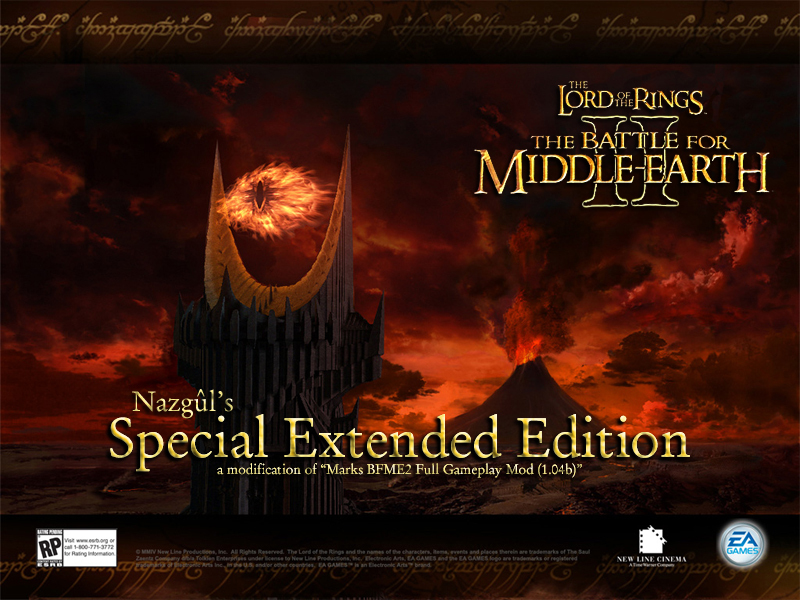 This mod runs with all items included, regardless if you use CE (Collector's Edition) or normal edition of Battle for Middle Earth II! The official question thread for S.E.E. - a modification of "Marks Full GamePlay Mod v 1.04b"
If you are NEW to the T3A forums - do read THIS! If you have any problems with DOWNLOADING, INSTALLATION or CRASHES - please use the dedicated SEE Support Forums for that - found HERE! And DO NOT PM ME IF YOU HAVE PROBLEMS GETTING THE MOD TO RUN! Use the Support Forums!!! I can't be expected to give support to each and everyone on a personal basis - AND run the mod production! We have Support Managers in that part of SEE Forums that are willing to help you all. If you have COMMENTS and/or SUGGESTIONS, use the official Development section of SEE Forums - found HERE! Also, please note that we have separate subforums there for the individual factions! If you have any BUG REPORTS or such observations, use the official Bugs section of SEE Forums - found HERE! If you want to read NEWS (about the SEE mod), go to the News section - found HERE! And PLEASE don't post any totally unnessesary comments that would qualify as simple "spam" (like "cool"... "no"... "yes") - be creative and informative when you post) cause I'd like to keep the threads from becoming 4367 pages long, k? And finally - don't QUOTE every G*d d*mn post "automatically"! There's NO need to quote if the post you are quoting is right above your post/answer, is there? It only clutters up the forum and makes the threads longer and harder to read. Only quote if the post you are quoting is NOT right above your post/answer! Rather logical, wouldn't you say? I really hope you will enjoy this mod as much as I do! Edited by Nazgûl, 11 October 2009 - 08:52 AM.